Summer is here and you know what that means! Well it means plenty of events to attend this summer. There will be graduations, July 4th celebrations, birthdays and of course summer vacations! Oh those events will be here before you know it, and what are you going to be bringing to those events? Well how about bringing a great pie, or cake? Something made with love? I would recommend something from Lucky leafs new summer recipes. I was a busy baking this weekend. We had a few friends over and I figured it was a great time to try out a new summer recipe from Lucky Leaf. 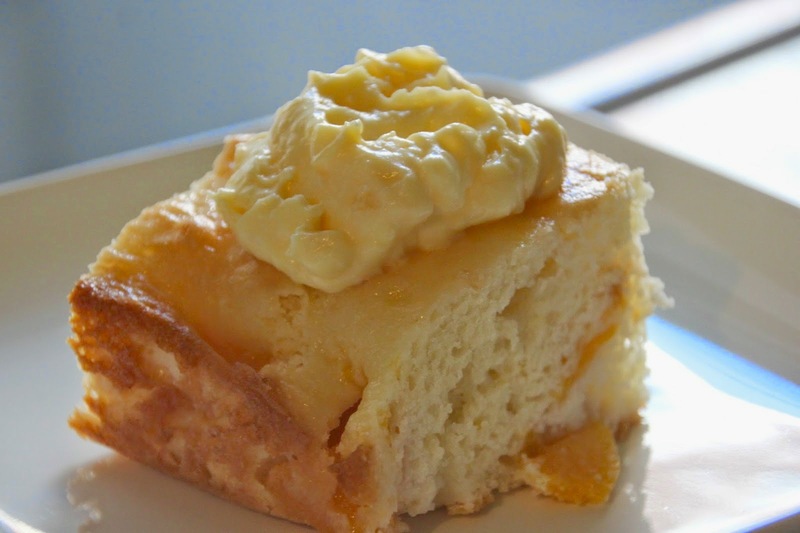 The Pretty Peach Cake with Pineapple Frosting, was amazingly easy to make, if you have the essentials and a boxed cake mix and a can of Lucky Leaf peaches you are good to go! My daughter helped me to make this sweet delight. This took literally minutes to put together and only 35 minutes to bake. With fork, mix together cake mix, LUCKY LEAF Premium Peach Pie Filling and eggs. Gently add sour cream. Spread batter into a greased 9x13-inch baking pan. Bake 30-35 minutes or until a wooden toothpick inserted near center comes out clean. Cool completely. Refrigerate until ready to serve. Mix together cream cheese, instant pudding, and crushed pineapple with juice. Gently fold whipped topping into cream cheese mixture. Spoon a dollop of cream cheese mixture onto each serving. I wanted to share half of this cake with my co-workers (since this makes 12 servings I had plenty to spare) and my co-workers were delighted and jumped at the chance to try this peach cake… And how did they like this? Well they devoured it! And one asked for the recipe right away. I was happy to share this easy recipe with her. As a working mother she just loved the ease of this cake as well. This is a cake that would work wonderfully with someone traveling to an event. This cake is solid, and will travel well. I was able to wrap this in tin foil and carry this to work and it arrived in great condition. So if you have to travel, and tote the cake along I would recommend the Pretty Peach Cake with Pineapple Frosting, this will stand up to traveling and will last for a few days. Well the cake may stay fresh for a few days I am sure the cake will not be around for a few days. It is so light and delicious this will be one of the first items to go at you party I am sure of it! Here is a tip, just because the recipe seems simple does not mean it does not taste like it took hours to make. These simple quick recipes are great for busy mothers like me, who want to give their best but only have a short time to do it! 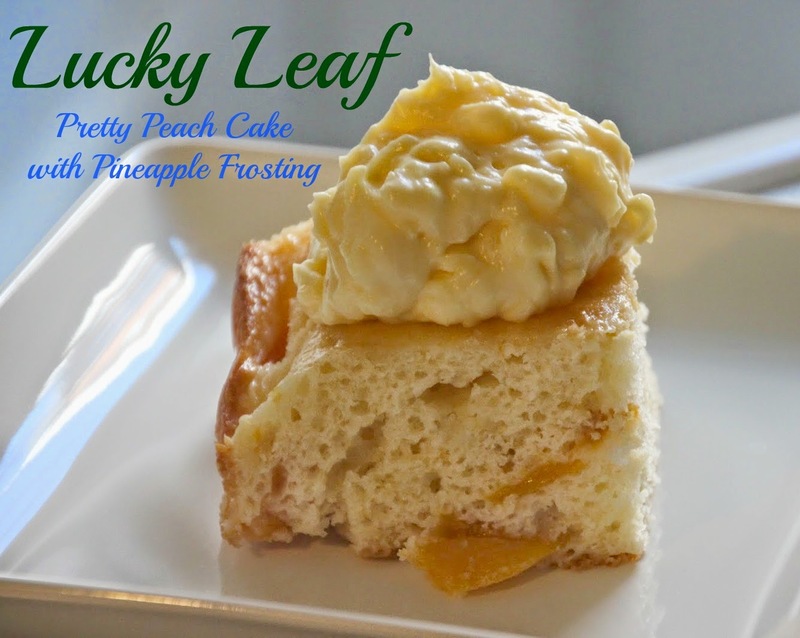 If you are looking for a recipe that is simple, but tastes anything but simple I would recommend Lucky Leaf Pretty Peach Cake with Pineapple Frosting, your family will love it. The generous folks at Lucky Leaf are giving one of Susan’s Disney Family readers a chance to win Lucky Leaf Pie Fillings, and recipe cards. Would you like to win? Well just let me know your favorite recipe from the Lucky Leaf site? There are also other ways to enter. Please enter below. You can purchase Lucky Leaf Pie fillings at your local supermarket. Make sure to check out the great recipes on the Lucky Leaf site, and like them on Facebook and follow them on twitter for more information. I am going to make the recipe that you have here. It looks delicious. But I really also want to make the Cherry Pineapple Cabana Cake (Dump Cake)! Yummy! I want to make the Blueberry-Pecan Crisp.Your recipe looks good too! I would love to make the Sweet Cherry Gianduia Parfait. Cherry Bliss Brownies sound oh so good. I'd like to try the Apple Custard Pie. I would love to make the cherry pretzel squares dessert recipe on the website! I'd love to make the Cherry Vanilla Chocolate Chip cake although I'd substitute applesauce for the eggs. I would like to try the Cherry Chocolate-Brownie Cheesecake recipe. Cherry bliss brownies sounds delicious. Yum! Would love to try. I'm a sucker for peaches.. that looks delicious. I'd also like to try the Peaches and Cream Cake. I would like to make the American Flag Cake. The apple brown betty recipe sounds delish. I would like to try the Amaretto Peach Cobbler. I want to make the Apple 1-2-3 cake. 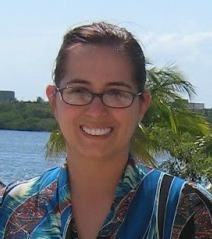 I'd like to make the Fluffy Blueberry Cream Pie with Toasted Coconut! Thanks. I want to make the Chocolate Heaven Pie. I'd like the cherry bliss brownies. I would like to make the "Apple Cheesecake Bars with Sea Salt Caramel Sauce". The cherry cheesecake pretzels squares look easy to make and delicious. I would like to try the Cherry Chocolate Brownie Cheesecake recipe. I want that pineapple icing! I have never heard of it. I love pineapple. Don't know why that never occurred to me! Yum. The apple cheesecake bars sounds absolutely amazing! oh my gosh. Blueberry pecan crisp for SURE. My husbands favorite dessert is blueberry crisp!! I would like to try to make the Cherry Chocolate-Brownie Cheesecake. I would love to make the apple pie cinnamon rolls. I would love to try the Cherry Bliss Brownies. It looks yummy! I would like to try the Apple Spice Baby Cakes recipe. I'd like to try the Apple Brown Betty Recipe. I'd like to try the cherry bliss brownie recipe. The Apple Custard Pie would be good. I would love to try the recipe for Blueberry Snack Bars. First things first :) I love cherries, so the very first thing i'd make would be the Mini Cherry Pecan Pies. I would love to try the Cherry Pretzel Squares recipe. I would try to make the Cherry Almond Crumb Pie! The Cherry Bliss Brownies would be delightful!! Thanks for the giveaway. would love to try the peach cake. I would never think about combining peach and pineapple but this looks delicious AND healthy!!!! There are so many friends that would enjoy this. I think I will make this for the next girls get together. This recipe looked so good, I copied it down. I am due to make this this coming weekend. I thank you for the share. This recipe looks and sound good. That looks and sounds so good ! If I had everything here I'd be making it right now. Thank you for sharing it with us ! !